Description of the soul of furniture of The Imix Club - Designer and Creator of fine hand crafted furniture, made in solid wood, best of breed joinery architecture and fine finish. Creating Ming Style Chinese furniture, Modern Chinese furniture, Modern furniture to Art deco furniture. What can be called a fine piece of furniture? Furniture that is serene, authentic, and pure. It should embody and articulate beauty, grace, integrity, and truthfulness. Graceful form married with exquisite choice of materials and meticulous handcrafting to create a piece of furniture that has true lasting quality and appeal. A piece of art that speaks to our inner self. At the same time, it should be an effective utilitarian item, having a hand in glove relationship to the day to day life of its owner. Like a faithful servant, always humbly performing the intended duties, what one professes should be what one delivers. Best is when function and aesthetics has become one, fused seamlessly. There should be the courage to stay simple and restraint - an essential quality for a piece to be timeless. A mastery piece may even seem undesigned. Its features should be just right, often the work of much distillation and design cycles to reach the perfect balance. Likewise, novelty shouldn't be pursued for novelty's sake. If a designed form is a beauty and classic, any motivation to change it should only be pursued with much reflection and deliberation. In the design world, it is common knowledge that novelty is not synonymous with goodness. 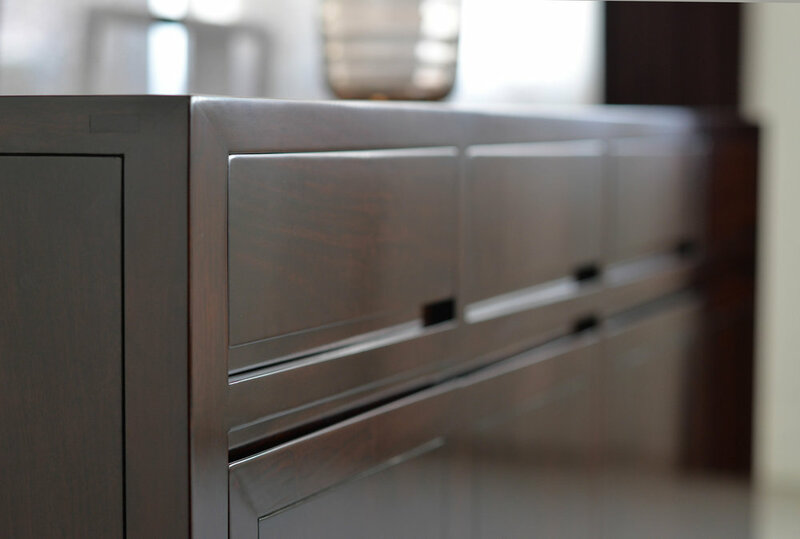 On a fine level, the piece of furniture should be crafted with the utmost attention to details, inside out. It doesn't need elaborate ornamentation to draw attention, but an air of finesse that is subtlety revealed in the smallest or plainest areas. On a wide context, the piece of furniture should elevate the mood of an interior, enriching the space. Not a piece that falls into the background into oblivion, nor one that draws attention with too much effort. A fine piece of furniture should age well. Quite in stark contrast to the planned obsolescence prevalent nowadays. Would a piece grow graciously with you over time, or does it lack the quality from day one? Is the piece designed and crafted for the enjoyment for decades, if not even longer as a piece of valuable future antique? Many factors work together to achieve this goal, not the least is the vision of the furniture owner. In another perspective, a fine hand crafted piece of solid wood furniture may display certain imperfections. This may arise due to the inherent unpredictability of solid wood material, or to the slight unevenness of hand crafting. Connoisseurs will testify why such qualities is the essence of warmth and beauty that set a lively piece of furniture apart from the rest. Perhaps, like none of us is perfect, this imperfection is the distinctive soul of each piece. After all, the piece that stands the test of time can testify to be a fine piece of furniture.